It’s here! 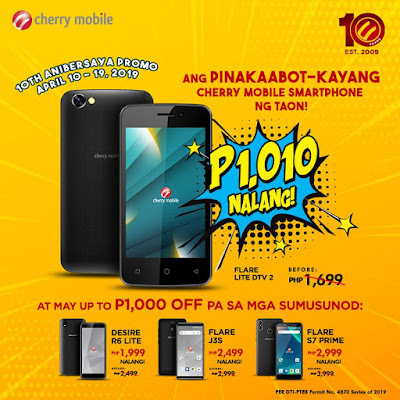 .. Cherry Mobile’s 10th Anniversary Promo! The most affordable smartphone with Digital TV – Cherry Mobile Flare Lite DTV2 now at P1,010! Plus…enjoy UP TO P1,000 DISCOUNT with other units! Sale runs from April 10 to April 19, 2019 in all Cherry Mobile stores and kiosks nationwide.